Our last day of the 80 mile 8 day circular walk around the Lake District over all of the English 3000 foot mountains and as many others as I could reasonably fit into our route. Today was Coniston to Boot in Eskdale. Once again we were on the hills by 9am heading up a steep track to the Walna Scar Road and across to the main route up the Old Man of Coniston. We had low cloud and Scotch Mist so no views and cold damp conditions. I took a shot on my phone of the old mine workings for a bit of light relief. It took 2 hours but there were no views at the top as we walked along the summit ridge then dropped down to the saddle between the Coniston ridge and Dow Crag. We were a long way down before we saw anything at all. We came down to the valley and stopped for a bite to eat. 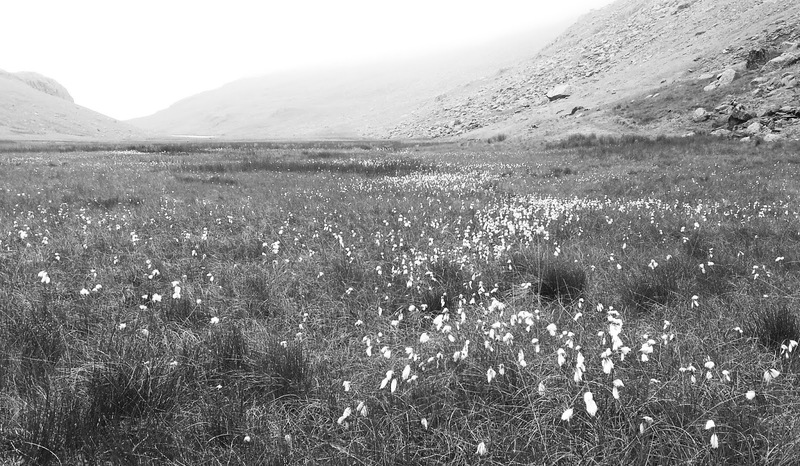 I photographed the misty view with cotton grass in the foreground as we moved off. On to Seathwaite Tarn and down to the Dunnerdale valley. From here it was a punishing climb steeply upwards to the rocky summit of Harter Fell. It was 2.30 pm and we stayed on top for about an hour taking photos as the clouds lifted and thinned and the sun came out. 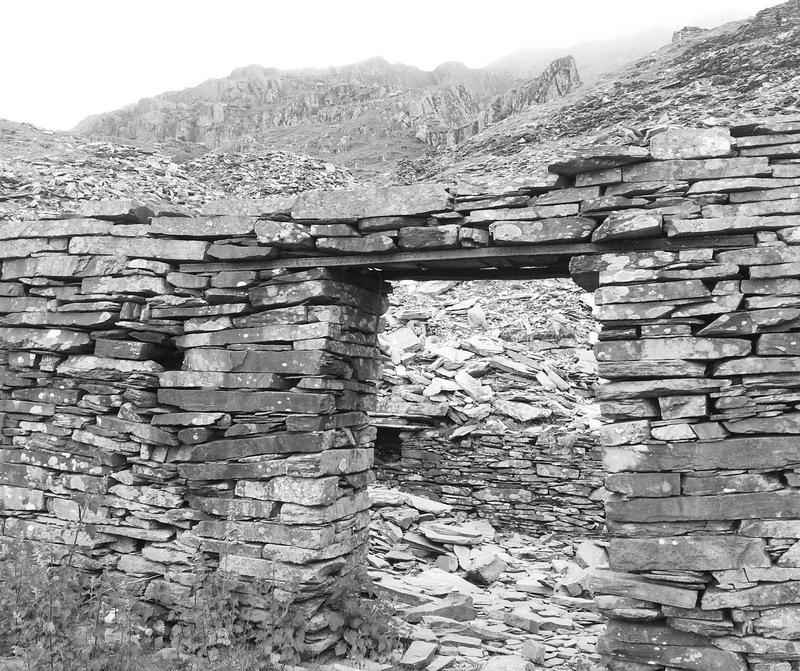 I took some photos on Ilford FP4 to the coast and then to Scafell as conditions improved using a red filter on the lens to emphasise the sky. I ended up with a shot that I will make into a panoramic with Scafell on the left and Crinkle Crags on the right. I also took it on my phone and edited it with Snapseed. It’s often difficult to make skies as dark or contrasty as they will be when I print them, and I don’t overprint them! I discovered that once converted to Black and White in Snapseed the Drama filter gave an effect similar to that produced by a red filter with traditional film. From Harter Fell it was a steady walk down to the Woolpack Inn in Eskdale, the end of our trip! We celebrated in the sunshine with a couple of pints, Eastgate Ale then Oyster Stout. Overall, it was a great trip, good walking, good beers, good food. I like multi-day walks, they allow you to see lots of different views every day with no need to retrace steps to reach new ground. Al’s a good friend that I’ve known over 40 years and is always good company and most importantly he laughs at my jokes. The weather could have been better on the big mountains but I still have some good new shots from 6 of the 8 days. I took 13 rolls of 120 film with 10 7×6 cm shots on each film, 12 rolls of Ilford FP4 and 1 roll of Ilford SFX infrared film. Later we watched the opening match of the World Cup on the big screen in the bar, so there was a good reason for the delay in doing this post!